Early morning, ploughing through breakfast to catch the No.4 bus over to the RDS in Dublin. 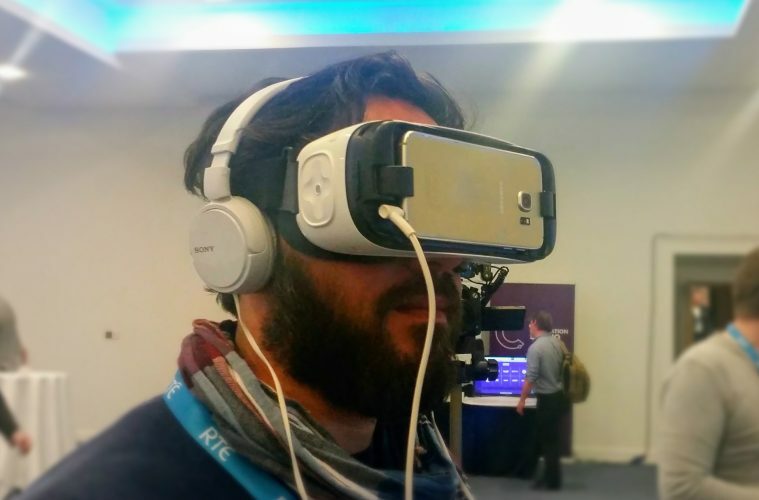 Rushing through the gates for the biggest Virtual Reality event in Ireland. This is my review of the 5th AR/VR Innovate Conference in 2017. Since this was my first time to cover a conference in this industry, I didn’t know what to expect. Of course, I still have my fair share of playing with all things virtual since my PhD at UCD. The conference was very well attended with many of the delegate seats taken. The quality of the speakers was amazing with the likes of James Corbett from SimVirtua and Dermot Casey from NDRC bringing in their own unique insights. There was a great mix of topics with relevant successful cases in using virtual reality focusing on retail, sports, and heavy manufacturing. One panel that caught my attention was the hard truth behind funding AR/VR. Once you Passed the tall white Roman pillars across the concert hall you arrive at the exhibition hall where all the awesome tech is there to play with. I had the opportunity to try out not one but three Hololens projects, Samsung VR developer kit, Oculus Rift and my good old favourite Google Glasses that suddenly felt somewhat insignificant to the rest yet humble for kickstarting the virtual wave. Another piece of amazing augmented reality kit on showcase was DAQRI’s famous “Spaceballs soldier” look-alike Smart Helmet. I admit when you put it on you feel its weight but you get used to it rather quickly, the view angle was outstanding and the media stream was brilliant. The other technology that stood out in the tradeshow was vStream’s interactive screens. Imagine a house window that is a touch screen you can use apps on! The technology is based on transparent OLED display with robust interactive content. The last time I saw this technology was at the CEATEC trade show in Tokyo, how quickly it arrived at our side of the World. A looong time ago, I worked in Large Scale tradeshows and industry themed events. They were fun, exciting and very hard to crack. The biggest challenge was to discover the best formula, the recipe that can combine the right audience with a quality content of a conference, sizable tradeshow (not venue size) that matches the audiences’ needs, and momentum to attract all the best talent in the industry. With the right exhibitors, the event will have a unique position to stand out from the rest as well as an important revenue stream that can heavily support the event budget. The ARVR Innovate conference had some of the most talented and respected experts in the industry. The talks were very relevant and networking was first class. If you are debating whether to buy the 2018 ticket here’s my advice. Whether you are veteran or newcomer to the industry or you are an enterprise exploring the potential use of Augmented/ Virtual Reality technology for your business then there is no better place to be at. The feedback, network, and connections you will receive are unmatched. So, go ahead and click that “buy ticket” button! Next ArticleWhat is an SLA and which essential terms should be included in one?